Optimize your hydration with Hyburst! We all know how important it is to stay hydrated, especially when you’re out doing your TrailblazerGirl thing. But our friends at Hyburst want to make sure that you are not just flushing your system with water, but actually absorbing the water and getting those essential electrolytes that your body really needs. Hyburst contains a special blend of electrolytes, minerals, B Vitamins, and a touch of caffeine from green coffee, that are ideally formulated to hydrate, energize, and promote the proper functioning of your body’s core systems. Only organic, non-GMO, vegan, gluten free ingredients are used, and it’s free of those artificial flavors, artificial sweeteners, and sugar alcohols that cause bloating and stomach issues. Plus each convenient, single serving stick-pak contains only 15 calories with less than 1 gram of added sugar. As recommended, we dissolved the powder in a little room temperature water, which helps to liquify the organic coconut water, followed by cold water and found both flavors (Pineapple Orange and Strawberry Lemonade), pleasant tasting – not overly sweet, with a nice fruit flavor. 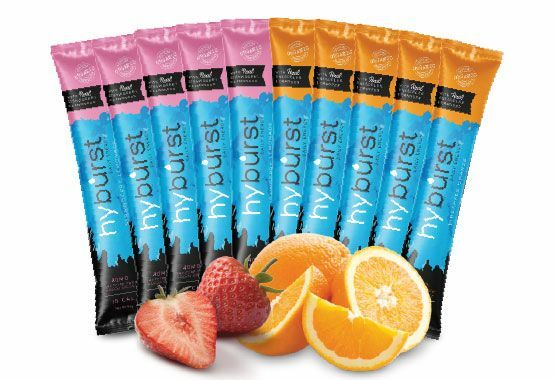 For a healthy, organic, energizing way to hydrate, check out Hyburst!